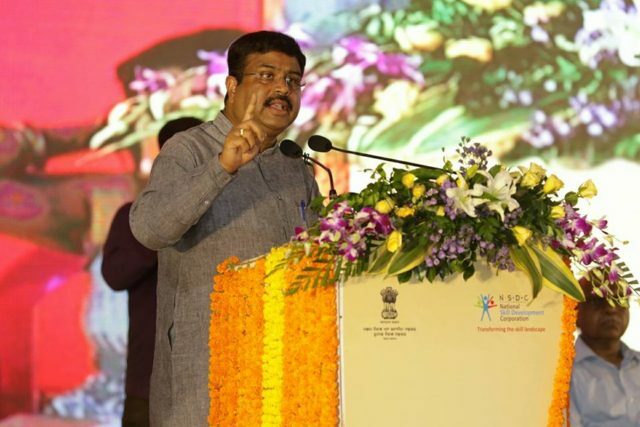 Bhubaneswar: Union Minister for Petroleum and Natural Gas and Skill Development & Entrepreneurship Shri Dharmednra Pradhan has said that, “LPG penetration in the State of Odisha has reached 58.55 % by 1st May 2018 which was at 20% level in June 2014 and the government has set a target of providing gas connections to 80.0 lac household by the end of December 2018. Pradhan added that 24.23 lacs connections have been released under Prime Minister Ujjwala Yojna and 1000 new LPG distributors will be added to the list in the last two years which shows the enhanced LPG penetration in the state. Speaking at the Pradhan Mantri LPG Panchayat held today at Mangalajodi in Tangi Block of Khorda district of Odisha as part of the Gram Swaraj Abhiyan Pradhan said that, currently 4 bottling plants are existing in the state of Odisha (2nd Carousel added at Balasore Bottling Plant & 2nd Shift started at Jharsuguda Bottling Plant Last Year) and three new bottling plants are being planned to be set up in Khorda, Bolangir and Rayagada districts in the state. LPG Panchayats are being observed to promote learning through peer group interaction – Kuch Seekhein, Kuch Sikhayein, where apart from experience sharing, it also aims at safe and sustained usage of LPG, to maximize customer is demonstrated. Women who have experienced the benefits of cooking with LPG can now boost the confidence of other women about adopting this clean, green cooking fuel safely and without any reservations or misconceptions. Sharing of experiences by actual users on how to use LPG safely, as well as spread the message of its multiple benefits, like health, environment and empowerment of women and learning through peer group interaction are the objectives of LPG Panchayats.